Current courses are viewable in the Course Catalog. Instructions on how to create, revise, and inactivate courses are below. CourseLeaf CIM can be accessed at courseleaf.rice.edu/courseadmin. A detailed step-by-step wiki to perform any action in CIM is available here. The Office of the Registrar (OTR) and Administrative Systems implemented CourseLeaf CIM (pronounced like the name "Kim"), which is a course inventory and curriculum management platform, with customized online forms and automated workflows, designed to ensure accuracy across an institution’s courses and programs. 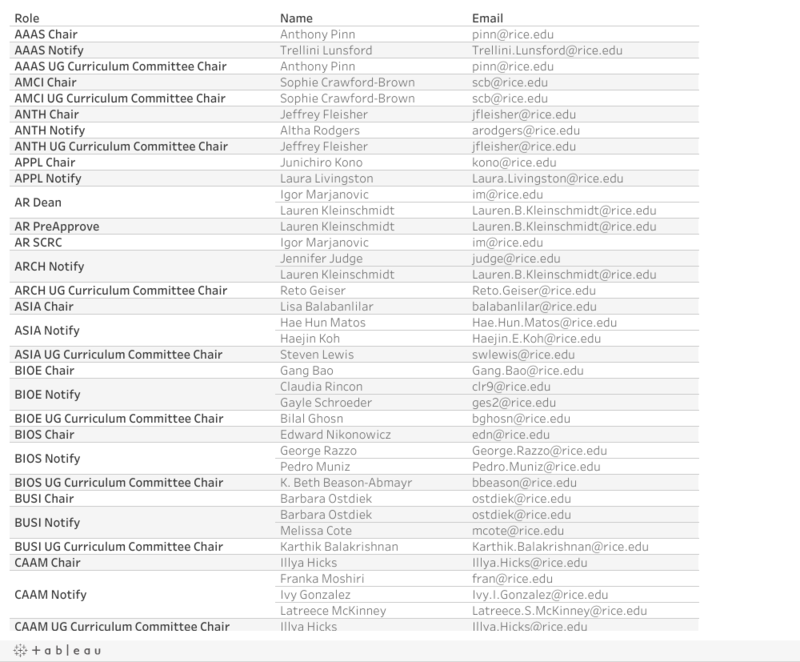 It allows departments and schools to collect the needed information for revisions to courses, provide notifications across campus for affected units, and integrate into the General Announcements so that revisions don't need to be made on each and every General Announcement page. CIM has replaced the New Course Request Form and the Course Change Form. Effective August 6, 2018, all course change, new course, or course inactivation requests should come through CIM. It will collect all the needed information up front for course changes and new courses, reducing the number of times forms are sent back to your department. It will automatically route requests to the appropriate approvers, so you will no longer need to send requests through campus mail. You will also be able to see where the request is in the process. It will allow you to digitally sign the request. It will pre-populate course change forms with the current information about the course. You will only need to enter the information that needs to be changed. It will allow you to see what other academic programs use a course to see the impact of any changes. It will allow you to see other courses that reference the course in the course description, prerequisites, and/or corequisites. Anyone who creates new courses or submits changes to current courses. Anyone who approves new courses or changes to courses, including department curriculum chairs, department chairs, deans, and School Course Review Committee members. Anyone who assists faculty in any of the above tasks. Changes in the procedures to create new courses were approved by Faculty Senate in November 2015 with the goal of enhancing faculty oversight of the curriculum. The full Working Group report and recommendations are posted on the Senate webpage, and the memo from the Provost and Faculty Speaker is available. For new courses for the Fall semester, the deadline is March 1, with an extension to August 1 for visiting faculty and postdocs and new faculty hires teaching their first Rice courses in the fall. For Spring semester courses, the deadline is October 1. For departmental courses, SCRC review is limited to consideration of credit hours awarded for the course. For extra-departmental courses, SCRC review will be more extensive, except in the case of FWIS, COLL and LPAP courses, for which current review procedures will continue. The course review process for Fall courses will be completed by March 15. The process for creating a course that will be taught only once (e.g., by visiting faculty or postdocs) is expedited – there is no SCRC review. These courses will use designated Special Topics course numbers 238, 477, or 677 depending on the level of the course. All subject codes will use these numbers for one-time courses; each new one-time course is created as a new section of the Special Topics course. The title of the course will appear in online registration and on the student transcript. Students may take a Special Topics course with the same subject code and number more than once, since the section titles will vary and will appear on the transcript. These courses do not replace or displace existing Special Topics courses; they are specifically for courses that will be taught only once. The deadline for submitting forms for one-time courses to the appropriate Dean is August 1 for Fall semester courses and December 1 for Spring semester courses. NOTE: There is no SCRC review for graduate courses. The signatures and process for graduate courses remains unchanged. When proposing a new course, faculty can indicate if the course should be considered for distribution credit on the proposal form. During the approval review process for new courses the School Course Review Committee (SCRC) will assess the request against the criteria in the General Announcements and approve or deny the request during the proposal review. The process for new departmental courses is handled automatically within CIM. Complete a new course request in CIM. Be sure to complete all fields and thoroughly answer the prompts for the evaluation of a new course. If the course is a one-time course, you must use the departmental Special Topics course number 238, 477, or 677. A list of course subject codes and the relevant Review Committee for each is available here. For a one-time, Special Topics course numbered 238, 477, or 677 there is no SCRC review, but the signature of the SCRC chair is still required. For a recurring course, the SCRC will review requests within 10 working days of the October 1 and March 1 deadlines; the SCRC chair will sign approved course request forms. The SCRC review is limited to consideration of credit hours awarded for the course, given the contact hours, work, and assessment information provided on the course request form. A pilot version of Guidelines for Assigning Credit Hours to Courses is available here, illustrating minimum standards for awarding credit hours for the course types identified by the Office of the Registrar (OTR). Review of course content, subject matter, methodology is excluded; those are the responsibility of the department. OTR will create the course and notify the relevant department of the course creation. For a one-time, Special Topics course numbered 238, 477, or 677 there is no SCRC or CUC review, but the signature of the relevant review committee chair is still required. Sharing among SCRC and CUC members of best practices in different departments is encouraged, with the goal of achieving greater consistency of standards across departments and among departmental and extra-departmental courses. Review by CUC is waived for new extra-departmental course requests with the following subject codes: AFSC, COLL, FWIS, HONS, LPAP, LPCR, MILI, DSRT. The SCRC chairpersons are listed below. A list of individuals who need to approver CIM requests, as well as those who will receive notification of the approval of a proposal are listed below. If you recognize an error, please contact registrar@rice.edu. To revise a course that is currently active, a request to revise the course will need to be submitted through CourseLeaf CIM. The lead department will normally be the one in which the faculty member requesting and teaching the new course is primarily affiliated. The new course form required signatures are those appropriate to the lead department. The form must also be signed on the front page by the chair of the cross-listed department or the program director of the cross-listed program subject code. In these cases, only one New Course Request Form is required. The faculty member responsible for the currently existing course completes a course change request in CIM to request the cross-listing. Creating the new course number in another department or program requires completion of a new course request by that department or program, and submission to the appropriate Dean and review committee. This is handled automatically in CIM. Departments submit a request to change the course in CIM. The new course review process is not involved because these are not new courses. Courses that have not been offered for several semesters or will not be offered in the future should be inactivated. To inactivate a course that is currently active, a course inactivation request l need to be submitted with all the appropriate signatures to OTR. Inactivating a course allows the course number to be reused after seven years since the last enrollment in that course number. If needed, OTR may inactivate numbers not used in the past seven years if they exist, thus freeing additional numbers for departments to use for new courses. Courses must be inactive for seven years since the last enrollment to be eligible for reuse. OTR has created a dashboard for you to be able to see which courses are eligible to be reused on the Tableau Server, and the dashboard can be accessed by clicking here. You must be on the Rice network or use VPN in order to access the dashboard. Important note about the dashboard: only courses that have been offered and have had enrollment appear. If a course has been created and never offered and/or never had enrollment, it will not appear.